Chuck Sipes trained his forearms with diligence. Underdeveloped forearms irradiate physical flaccidity in a t-shirt. On the bodybuilding stage, Dorian Yates separated himself from the pack, to the tune of six Olympia titles, in part because of massive forearm development. From a functional standpoint, i.e. bouncing in the barroom to lifting barbells, forearms are key! The forearms are utilized in virtually every strength training exercise and greater forearm strength has a cascading effect which allows you to squeeze the barbell harder, which engages a greater number of muscles, and, in turn, allows you to lift more weight which leads to total body size and strength gains. Many trainees ignore forearms all together and others don’t look beyond the wrist curl. Some pure mesomorphs are born with inflated Popeye-like forearms and never have to train them to build them—this routine is for everyone else. Whether the goal is forearms for form or function, in this two-part series I am going to show you the optimal way to train forearms. Each workout should be performed once a week, in addition to your exiting routine. If you want to specialize in forearm development, do each session twice a week; this routine is most effective in a caloric surplus. In addition to this detailed article, you are provided with a detailed video tutorial of each exercise. From a firm handshake to the field of play, grip strength is of fundamental element; in any pulling exercise grip can very easily be the limiting factor. By doing pull-ups grabbing a towel instead of a bar, you intensify the grip challenge to the umpteenth degree. Your hand position gripping the towel keeps your wrists neutral which helps prevent awkward twisting and lets you strengthen the forearms and fingers. Loop a medium-sized towel over a pull-up bar and tightly grab both ends of the towel. From an arms extended position, pull yourself up until your chin is higher than your hands, hold briefly then lower yourself to the starting position under control. Repeat this for eight to 10 reps; when you can complete additional reps beyond this add additional weight. This is done for two sets. If you do not have the strength to perform this exercise, do towel lat pulldowns or assisted pull-ups. Because of the neutral grip used when performing hammer curls they target the muscles of the forearms to a greater degree than dumbbell biceps curls. By adding fat gripz you increase the diameter of the dumbbell handle from around an inch to 2.25 inches. This, in turn, forces you to grip much harder when performing hammer curls and thus the muscles of the forearms are activated to a greater degree. Stand up straight with a dumbbell (fat gripz attached) in each hand which is held at arm’s length. Your palms should be facing your torso. This will be your starting position. Now, while holding your upper arms stationary, start with the right side by curling the weight up using full range of motion and with absolutely no upper body swing. After briefly stopping at the top, lower the weight under control and stop 15 degrees short of extension, while squeezing the dumbbell hard, hold it in this position for three seconds; this isometric pause causes greater brachioradialis activation. From here, lower the dumbbell to arm’s length and repeat on the left side. Continue in an alternating fashion, performing six reps on each side. No fat gripz? Just do hammer curls as described as heavy as possible. My colleague, Tim Henriques, when talking about wrist rollers, says, “They are to forearms what barbell squats are to your legs, if not better.” This exercise builds amazing grip strength and works the forearm extensors hard on the way up and the flexors have to control the weight on the way down. Grab a band and loop it over the end of a barbell in the squat rack at approximately shoulder height. From here, hang a kettlebell in the band while making sure a weight equivalent to the kettlebell is on the opposite side of the barbell. This will give you the thickness of an Olympic barbell collar with the stability of the rack and eliminates the potential shoulder fatiguing limiting factor from a traditional wrist roller. From here, in the arms extended position, grab the collar in front of you with a pronated grip, your feet should be shoulder width apart. From here, rotate the collar toward you like you are revving a motor cycle. Once the kettlebell has reached the bar height slowly lower it under control. Repeat this for four reps and three sets. No bands—you can make a homemade wrist roller out of PVC pipe. We just hammered forearm extensors on the concentric portion of the rep and flexors on the eccentric. This exercise works the flexors on the concentric portion and the extensors on the eccentric for a slightly different training effect. This set up is the exact same as the extension exercise except you will roll your wrist the opposite way as before. This tiny idiosyncrasy totally changes the training effect. 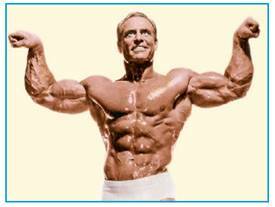 In the realm of physicality, forearms will only increase your prowess! You have the will now you have the way. Make sure to watch the tutorial to see these exercises in action. Check out some of the proven body part specialization routines in Jailhouse Strong HERE.